Kirk N. Ellis & Associates was established in Reno in February 1987, as a Professional Structural Engineering firm. The company has completed a wide variety of successful projects throughout the Northern Nevada area, Las Vegas, and Northern California. We provide many types of structural engineering services for all types of structures: including investigations and reports; feasibility studies; preparation of structural designs, structural drawings and specifications; and construction phase support services, to name only a few. 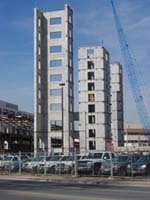 We are a fully equipped Structural Engineering firm. We maintain an extensive library of completely interfaced structural analysis and design software, CAD software, and word processing capabilities. Computers are used extensively in the daily operations of the company. Computer Aided Drafting (AutoCAD Release 2010) is used almost exclusively for all drafting functions. We have personnel on staff with considerable structural design experience in Nevada and Northern California. We are quite familiar with the snow loads, high wind forces, and the earthquake loading in the vicinity. By virtue of an experienced, competent, loyal, and motivated technical and clerical support staff; KNE and Associates can provide comprehensive Professional Structural Engineering services on projects of all magnitudes: from the very small to the very large. The level of technical sophistication provided on each respective project is tailored to the project. Kirk's 30 years of Structural Engineering experience molds, shapes, and directs each and every KNE & Associates project.